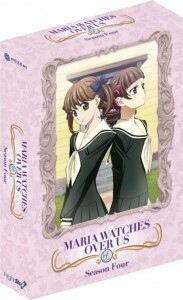 Right Stuf/Nozomi/TRSI/any other name you can come up with is back with another DVD release. And this time it’s a return to Maria Watches Over Us. We got some giant shiny DVD art for two Nozomi Entertainment (Right Stuf) titles coming out later on in the year (the artwork isn’t final). I haven’t seen these anywhere else yet, so enjoy. First we have the second season of Maria Watches Over Us. edit- While I haven’t been able to confirm this with 100% accuracy, the other side of the box will have this image in the frame. Then next we have the classic Towards the Terra movie.